It sounds like a parody, but it isn’t. An Ohio Amish man was arrested Monday for shaving off the manes and tail hair of an Amish neighbor’s horses. Apparently there was bad blood between them (the two men, not the man and the horses). He also left a threatening message on the other party’s answering machine. Inspired by the Bergholz group? I don’t think horses place the same significance on their hair as Amish do, but sounds like an ugly situation nonetheless. It also made me wonder how fast horse hair grows. Not something I thought I’d be pondering Tuesday morning. Meanwhile, you have probably heard that 7 more men from the Bergholz group were arrested last week, including bishop Sam Mullet. They have been charged with federal hate crimes–meaning they could face up to 10 years in prison. What these people have done is bad. But I’ve got to be honest. My first reaction was that 10 years seems like a lot. What do you think? I know we don’t have all the facts. But do the potential punishments sound like too much, or do they strike you as about right? I dont think that 10 years is too long, in fact probably not enough. The actions of those men were brutal, filled with hate. In the Englisch world, this would be likened to painting their homes and cars with slanderous words, advertising in the paper,etc. Its the mentality that is wrong. Yes, its only hair, however, the hair is a standard. It signifies faith, tradition, marital status. For these men to have done this means they appointed themselves as judge and juror, and interfered with a basic right. As the scriptures say, “An eye for an eye”. I think these men should be shaved bald, and imprisoned. Lets not forget the “behind” the scenes actions as well. Mullett is an evil man, who used his people as pawns to hurt others. His use of the women in his community should have him horsewhipped. Christians do not follow “an eye for an eye” – Jesus Christ told us to repay evil with good. It is certainly the Anabaptist teaching – to never retaliate in violence. 10 yrs. is to much.....!!!!!! I think 10 yrs. is to much , yes they were wrong ..
10 years seems a bit harsh for hair cutting, but again it sends the message not to harass others. You can’t hide behind your religion and get away with putting fear into others and breaking into their homes. Very sad the Bishop is involved with all of this. As for the horse hair cutting, that is not good. The horse needs his tail hair to swat the flies that bother him. I, too, think it’s disgraceful for those few who must use violence and hatred, to voice their opinions! And then to do that to the horses, too….what or who is next??? I agree with Mikey – if they can order community service for someone, why can’t they order that their beards and hair be cut? I guess it doesn’t work like that, but that seems the most logical to me. Mikey, et al…. here is the irony of this little “play” – when the judge sentences the Mullet gang (of thugs is what they are) to jail/prison time, the first thing that will happen during their intake is that their hair will be cut short and their beards will beards will be shaved off. It is standard prison protocol. They will be allowed to grow back short, cropped beards and their hair will be allowed to grow out, but when they first get there, they’ll be clipped and showered and shaved…. Serves them right! way to long. there are alternatives. and the public taxpayers pay for the prison terms at what $50,000? cost per prisoner per year for 10 years X 7. Three people came into the home of an Amish couple, held them down and cut their hair and beard. This is not a “haircut”, that is home invasion and assault, and probably a hate crime. People do not quickly recover from being assaulted and having the sanctity of their homes violated. Cutting the horse’s mane and tail is animal abuse. The animal will suffer for a long time, if not for the rest of its life. I think there should be a law against “animal abuse with intent to intimidate or terrorize”. Hurting animals in order to get at the owner is common in domestic violence and other criminal situations. It is really sick and should not be taken lightly. However, even if these men are given the maximum sentence, they are unlikely to serve the full ten years. I am sympathetic to the home invasion making this a worse crime. I’m not sure that was the case in each of these instances though, I’d need to check the details again. But at least in this most recent father-son attack, it was the reverse–the victim was invited to the attacker’s home. On the horses, the article reports that they “are fine”. Sounds like it was just the hair being cut, not the tail itself being clipped (and here again, since I know so little about horse anatomy/care, there may be something I’m overlooking). What those guys did was mean and destructive, but it seems to me that 10 years is rather extreme, and from the little I’ve read about this, the possible kidnapping charge sounds over the top. That sort of thing can backfire with a jury. Does anyone know what the Amish victims and the rest of their community think about this? As for the guy who cut the horse’s tail….what a shame that the horse didn’t kick him. The only reason I don’t think 10 years is too long is because if they did it once and stopped, then yeah, it’s a bit much. They, however, keep doing the attacks and now are starting on animals so I think they need to do something to put a stop to it. I know the Amish in Mesopotamia & Middlefield are happy and relieved that they have been arrested and charged . Many of them are fine with the 10 year sentence too .I know Sam had our Amish neighbors concerned . The local Amish schools even shut down for 2 days here after the first arrests out of fear over rumors of retaliation . Did all this and then to compound it “left a message on his answering machine”? What kind of answering machine does a good Amishman have, anyway? It might just take 10 years for these men to realize they are not above the law. They are repeat offenders and clearly realize their victims will not fight back, or press charges. As for cutting the perpetrators’ hair and beards-I doubt as far off track as they are, that it would even matter to them. However, one needs fingers to use scissors…lucky they aren’t in the Middle East! If a group of people knock on your door late at night, and then assault you as soon as you open the door, dragging you out onto your lawn while they pin you down, shearing you like a lamb (losing facial hair is a religious sin, akin to losing your virginity) — all for the purpose of causing you terror and guilt, I think you would probably not consider 10 years as excessive. This was a premeditated act of terror, nothing less. Attacking another man’s livestock is just another form of causing him terror. I agree with Bethany. This was an act of violence and hatred and the victims are going to suffer for a long time. Forgiveness does not fix the perpetrator nor does it stop repeat offenses. Along with the other offenses Mullet and his men committed, they definitely need to be somewhere they can’t hurt others. You can’t allow people who don’t and won’t respect the rules of society to recklessly run lose and damage people. I’d make him groom the horses till their hair grows back. Them poor horses didnt do anything to that man. Shame on him for doing that ! It’s not to long. Life is a bit much but 10 years is good. They knew better than most people how much they were hurting these people. I do not cut my hair. It is my glory.Now… I know most people don’t understand how important that is to me. Even some of my own family. But my church family does. That makes these crimes worse. The intent here was to be cruel and to hurt them. They should remember though,the story in the bible where David sent some of his men in peace on a mission and the enemy shaved half their beards and cut there bottem portion of clothing up to their buttocks. 11 samual 10:4.In comparison, 10 years is a walk in the park. There’s a lot of misinformation floating around here. While the Amish grow beards to show that they are married men, and the women do not cut their hair following Biblical precepts, it is not a sin to do so. This is a cultural rather than a Christian principle. Removing someone forcibly from their home is kidnapping, even if they are not taken very far, and it carries the same weight under law as attempted murder. Anabaptists do not retaliate, nor would they support the law doing so. I believe forcing a prisoner to have a haircut and beard-shaving would be considering cruel and unusual punishment in the USA, so it is not something worth discussing. The man who removed the manes and tail hair from the horses should be charged with animal cruelty. Horses need both to protect themselves from flies and biting insects. If the tail hair isn’t removed carefully, the tail itself can be damaged and any open wounds will possibly be infected. The owners wil have to provide the horses with fly masks and may have to bandage the tail to keep it from getting infected. Some animals are traumatized by being handled by strangers. The horse is not “fine”. The mane protects the horse’s vulnerable neck from cold in winter, from sun and insects in the summer. Tail hair protects against flies and grows slowly. A prison sentence is not retaliation – it protects the innocent from criminals. Most prisons are now called “correctional facilities” and make an effort to rehabilitate the inmates so they do not continue in their criminal behavior. I think the problem here is not so much that the perpetrators think they will get away with crimes because they are Amish. I think the problem is that the perpetrators think they will get away with crimes because the victims are Amish. Some English people prey on the Amish for the same reason. All people who live in a state are subject to state law, all those who live in the country are subject to federal law. Depending on the legal entity involved, the victims do not necessarily have to press charges for the law to be enforced. Thanks Marjorie (and Magdalena and others) for the info on horse hair. As I mentioned that is not my area of specialty, so I’m glad we have a number of people on here that do know something about our equine friends. Hey Erik. I think that 10 years is quite a bit of time for this. I know it has been happing alot lately. And now cutting the hair of a hourse off is beyond my thinking. I’m suprised that they might be getting time for this. Did the Amish turn them in? I thought they didn’t press any charges?? They will end up being found guilty of Assault & Battery, or the Ohio equivelent. If they serve any active time it will be less than 3 years. That would be my prediction from having been in law enforcement many years ago. The Kidnapping charge will be added to get them to plead guilty to a lesser charge. No one in their right mind should entertain the notion of them actually facing a life sentance. Not gonna happen. I think they should serve some active time, but 10 years seems excessive. Three would send a good message that you can’t do this and get away with it with a slap on the wrist. The sad thing is that these perpretrators are soiling the good name of wonderful people. They are not Amish, not in truth, not in action. Their actions make that clear. No Amish would use force in such a way. There are often divisions and disagreements within church communities in the Amish, just like in our evangelical churches. Usually people/churches simply split, and as sad as that is, it is at least a non-violent solution. Knowing how my Amish friends feel about this sort of thing, I do not think 10 years is too much. And I think it’s the responsibility of our ordered society to provide peace for all peaceful inhabitants. The Amish pray for the “state” and an answer to their prayer is for justice to be served. If you want more understanding into Amish theology regarding the question of the state, law enforcement, and Christian forgiveness, I recommend the excellent book, “Amish Grace” (by Kraybill, Nolt, and Weaver-Zercher). A must read for anyone who wants to know more about this group, this is the moving story of the murdered children of the Nickel Mines Amish in PA. If you have not read this book, you probably have some misunderstandings about how they see these issues, as I did. Seems a bit extreme when we have murderers, drug dealers and rapists who just get a slap on the wrist! Forgiving does not preclude protecting yourself from ongoing harm. You can forgive those who harm you and at the same time do everything in your power to prevent them from continuing to harm you and others. 10 years is definitely too much! I am not a proponent of the hate crimes legislation. With that said, each state has ample punishment for breaking and entering, assault and battery. I do not think kidnapping should be applied here. Yes, it was a very bad deed and the law was broken. People were publicly humiliated. I’ve sat in on a jury convicting a known drug dealer, who was only sentenced with eight years after leniency. A murderer just last wee here was sentenced to only eight years. Michael Jackson’s doctor who definitely had a lot to do with his death was sentenced to only four years. As much as I’d like to see them punished and to stop this wicked behavior, the problem lies in their hearts, and a stint in prison might or might not help them, but it would definitely give them time to ponder their decisions. Although 10 years, is definitely too much, IMHO. Our prison system is too easy on prisoners. I did a research paper a while back on why the Japanese have such a low crime rate in their country, and no looting during earthquakes and typhoons. Besides possible cultural mores, a sentence to a Japanese prison is one to be dreaded. The places are clean, but the sentences are harsh with labor and are not a place of comfort. Even the theft of stealing a piece of candy by shoplifting can carry the same sentence of stealing something of much greater value. So, if our prisons were less accommodating, as a whole, crimes like these would be virtually gone. some of you have indicated that you think that these “terrorists” will be released early, there is NO parole system for federal sentences, they will serve the full 10 years. And if they get into trouble in lock-up, they’ll serve more time. award, and they become??? what do you mean? actually i should have capitalized Sie, and it translates as forgive and you will be. True “vergeben” can mean award but it is also used for m forgiveness or to pardon, it has a multipurpose usage. There may no longer be a parole system for Federal offenses (committed after 1987)…but the sentence will largely be determined by a Sentencing Guideline system that could only come from the same folks who brought you IRS Form 1040. A point for this, a point for that, use this multiplier here, that multiplier over there, divide by pi, yadda yadda yadda. The U.S. Attorney will show the calculation to the judge, the defense can then argue whether the U.S. Attorney got it right, judge makes the final call on what goes into the formula and it spits out what is supposed to be sentences that are relatively equal. I am not an attorney, but I’d be surprised for a first time offense, no prior felony history, no guns, no drugs that you would see more then a couple years in minimum security. The statutes of Ohio are perfectly capable of handling an assault and battery and criminal conspiracy case, and the Judges are perfectly capable of taking into account the motivations of the criminals in determining a sentence. I agree wholeheartedly with Matt from CT and how interesting ( and discouraging) about the ludicrous “formula” for federal prison time. Must keep one’s sense of the absurd in today’s world! This matter certainly should be dealt with by Ohio law. And an over-zealous prosecutor and/or a potential sentence that seems too harsh to a jury can push jury members to acquit; I’ve seen it happen. But thats a different, though tangential, topic, as it’s not specific to the Amish. The alleged Amishness of the perpetrators here doesn’t seem to me to be an issue as they most certainly seem to have abandonned Amish ways. But of course the victims are, and the story brings home the vulnerability of the Amish who don’t fight back. What exactly is the Amish attitude toward defense of self and family under direct assault, and how can they be protected? Well, I take the pragmatic approach. I am not at all convinced hate toward a specific religion (non-Mullet Amish) is the driving factor here. It is more driven by a desire to humiliate and cause fear toward those few who have had the audacity to disobey or discredit Sam. Nevertheless It is necessary for the sake of peace that Sam Mullet be removed from power. Instead of spending ten years in prison, could the judge allow him the choice of 10 years in prison or life as an ordinary Amish subject no longer allowed to lead in any way. With the consent of a willing group of Amish, of course. Just pondering. As for the horse, cutting the mane was quite common in days gone by. 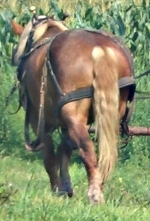 Some horses have had their entire tails shortened (Remember the bob-tailed nag?) since longer than I can remember. I am sure by fly season much of the hair will regrow. Not that it is justifiable to clip your neighbors horse. Indeed there was intent of mischief by the neighbor and differences must be settled, but in a more agreeable manner. Too bad about the horse.. makes the Amish look bad. Must be more to this story. On the 10 yr prison term… they deserve it if all is true…honestly I don’t think we can call them Amish. They left their church to go to this ‘cult oriented place’ and it is just so scary. We know the devil is around us and this has been very upsetting, knowing the media is having it ‘blown to all kinds of proportions’ yet we want them to repent and find a true reborn life again. These men commtted breaking and entering, and assault. They should be treated as any other. As far as crimes of terror or hate, it would seem to me that all assault contains these elements. A stranger who assaults someone in the parking lot is showing hate irregardless of the victims color or religious background. These crimes should all be treated equally. I truly question the validity of any religious authority figure who resorts to tolerating, promoting or committing violence for perceived acts of disobedience among others. Adherence to religious rules must always be a matter of conscience. If there is a problem, then the loving thing to do would be to have a brotherly or fatherly talk with the parties concerned, and resolve the issue with reason and charity. I like to think of God as the Gentleman par excellence: for those of us who believe, all we need to do is recall how the angel visited Mary to announce that she would become the Mother of Jesus. The angel didn’t make threats, but waited for her “yes”. God isn’t about force and coercion. Force and coercion are things that the sinful nature of people actually foments. Our God is forgiving, IF WE REPENT.Jesus also had His times of being angry, He threw out the taxpayers, He stopped them from stoning the repenting prositute, reminding them they ALL where sinful.God deals with many in His special way or reason.He allowed David to kill Goliath for a special reason etc. We must be forgiving and If someone comes to attack my family I would certainly defend them,then forgive them if they repent.Then, Be Angry but sin not.We need to show love and compassion and love but not to those that continue in their sinful acts.I pray for these thugs. Matt from CT, and Roger, thanks for your words abour federal vs. state charges. Personally I find this to be an example of federal law encroaching on a state matter, in fact, it is a rather odd case to describe as a “hate crime”. Likely of course there is more to the story (perhaps the victims preferred that it be prosecuted in this manner). In any event 10 years would be a very steep sentence…especially considering that people who cause actual physical harm routinely get less. Horse Hair Growth is SLOW! After some years I can get a good giggle now at what happened to my palomino show horse just one day before the show. Our pet goat, (yes pet!) for one reason or another decided to chew on Poco’s tail. The horse had to have been cooperative to boot, probably sidling up to the crack between the stalls for a nice itching session that included virtually all the hair on the horses tail! All there was left was the “stub”, picked pretty clean. It took two full years to get Poco’s tail to a showable state again. For a long time just going for a ride on him was a trial of patience! People laughed! Poco did not suffer any ill effects and as cooler weather saw him through the worst of the fly season all ended well. It is not uncommon for a working horse to have it’s mane “roached” or shaved off but fly protection is a good idea. However it is disturbing that Christians would treat other Christians like this. It is too much like the sorts who demonstrate at military funerals that are none of their business. We are to follow Christ’s example if we are Christians. How many of us really have given deep thought as to what would Christ do? Are we grabbing the reins from God’s hands? Amish vs Amish vs the 'English'. b) The Amish are humans, too, and will on rare occasions do crazy things, including brutal acts of violence towards other Amish. Their response is often one based on forgiveness and complete faith in God, but this falls considerably short of the expectations and requirements of the ‘English’ world. c) Any sentence would have to satisfy both the Amish and the ‘English’. We may think that a lengthy prison sentence is an appropriate response, but the Amish, perpetrators and victims alike, may consider this unimportant or even irrelevant. d) In most countries, the requirement for any sentence is that people acknowledge, recognize, and respect the supreme, often secular, power of the courts. e) Also, the defendant typically has to demonstrate that he understands the nature of his crime. If for some reason he doesn’t, many countries will refer him to a mental institution accepting that he cannot be held legally responsible for his actions. I’m not equating the Amish with mentally disturbed criminals, but the fundamental legal requirement stands: Be it road signs, physical assault, or animal cruelty, the Amish have to understand that such acts cannot be resolved privately and that they have to bow to the legal supremacy of the ‘English’ courts. And I’m not sure they’re willing to do that just yet.